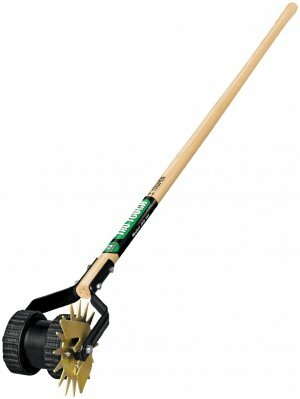 What’s the best manual lawn edger? To those not familiar with manual edgers, some of the devices may look like a sort of torture device used in the times of knights and armor. 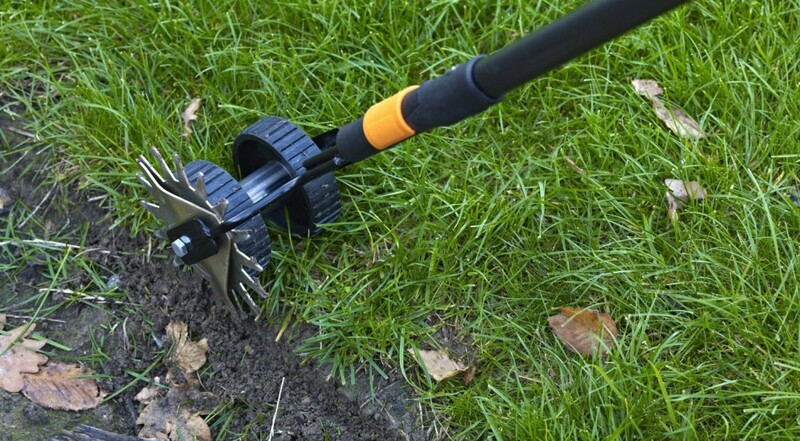 A popular manual lawn edger design features a rolling wheel with spikes on it attached to a long wooden handle and it’s looks are not deceiving because the device is a weapon – against weeds and untamed lawns. Even in this time of quick-change attachments that can turn a standard string trimmer (weed wacker) into a gas powered or electric edger, manual edgers are just as popular as ever. Manual edgers help spruce up the area where the lawn meets the sidewalk by producing a noticeable defined edge. The process prevents weeds from growing over into the sidewalk and helps to trim up areas where weed whippers or lawn mowers can’t reach. Durable – While some manual edgers have rolling wheels and bearings for more consistent edging, the basic design consists of a wood handle with a rounded or spiked metal attachment on the end. This makes the manual edger very durable, especially compared to using a string trimmer attachment that is at the mercy of the weed wacker engine, pull cord, and other equipment that has a tendency to misfire. Convenient – Manual edgers take up very little space in the shed (although string trimmer attachments don’t either) and can be pulled out and used on a whim. A consumer will no longer have to worry if they have enough 2-stroke gas on hand to start their string trimmer and they won’t have to mess with dragging cords out for their electric edger just to tidy up a small area by their sidewalk. Inexpensive – Even though edger attachments don’t require too significant of an investment, they must be replaced as often as the string trimmer unless they new unit is compatible. Manual edgers start off retailing for around $15 and will legitimately last a decade and longer. For quite a simple product, the consumer actually has a number of options available to them in regards to the manual edger they decide to buy. These reviews cover a lot of the main features as well as customer feedback that can be found within the scope of this product. The Truper 32100 features a very popular design among manual edgers – dual wheels for precise and convenient edging as well as a rotating spiked head. The handle is 48” which makes it long enough for taller users and the unit cleans up easily with a spray garden hose. The North American ash handle is very durable against breaks and the lacquered handle finish protects against common nicks and imperfections. The edging head also has extra protection with a clear coat finish and Tru Tough backs their product with a 10-year replacement warranty. With a retail price of just under $40, the Tru Tough warranty means you’re using this edger for roughly $4 a year – not a bad deal. People who bought or will buy the Truper 32100 should note that the first couple times using the product may be difficult. This is no fault of the manual device, just a product of not having a proper edge defined on their property. Each time using the manual edger will get easier but a proper technique must be established the first 2-3 times out of the box. Other than that most consumers say the product has been highly resistant to rust and is much more convenient than a loud, vibrating, weed whipper with an edger attachment. Simplicity and durability wed nicely in the Radius Garden 206 Pro. The design is basic, yet awesome at the same time. First there is a large round ergonomic handle that looks to dispel blisters and cuts for those huge edging jobs and enables the use of both hands simultaneously. Next is the sharp stainless steel looks with the bright neon green accented grips that make the tool look futuristic and stylish. 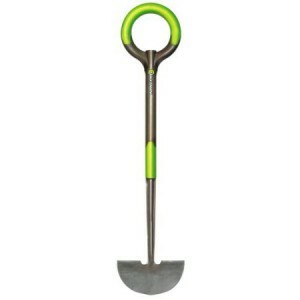 The Radius Garden 206 lacks a rotating head but features a solid shovel like design with a stepping flange. Durability is not a question mark as the resin-encased steel shaft is literally unbreakable and in the case of some freak destruction Radius Garden offers a lifetime guarantee. One might think that a punch this powerful would require a tool that needs to be lugged around but this unit weighs a very manageable 4 pounds. While the Radius Garden 206 Pro does have noticeably shorter handles, even taller product reviewers proclaim that the device is easy to use and even comfortable. On top of that a few older purchasers insist they could manage the manual edger with ease and absent of pain. With manual labor there’s always going to be some work involved and sharpening the factory edges of the 206 Pro will make that job easier. Commercial landscape companies even liked the unique design of the edger and noted an extra professional look when combined with the similarly designed Radius Garden shovels, pitchforks, transplanters, etc. Just as the name implies, all manual edgers require some manual labor. That being said, once the consumer has developed a consistent edge between their sidewalk and lawn, the process involves more maintenance than work. If anything, a manual edger is a good accessory to keep handy in the shed in case something happens to a string trimmer attachment or when a quick edging is all that’s needed.